J&S Adhesives supply adhesives and resins to the glazing and automotive markets. 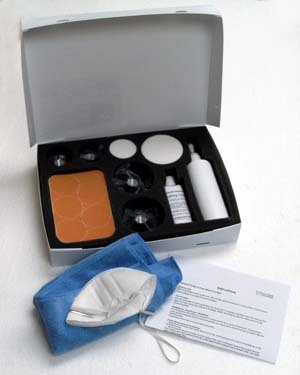 A unique bonding solution that has transformed the ultra violet adhesive industry and related sectors. Launched on the world market with a patent-pending, the range has proved so popular that it has already taken 50% of the UK market. *(From figures supplied by distributors of J & S Adhesives). 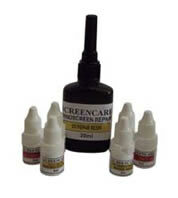 Strong clear and easy to use, Safe2Bond is an exclusive formula that bonds in seconds and eliminates the need for costly and potentially harmful UV lights. Industries which rely on UV curing can wave goodbye to costs, fuss and the health and safety concerns. 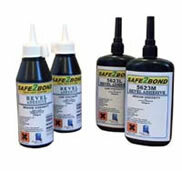 Safe2Bond's revolutionary "safe light system" means that once the bonds are applied, they cure on demand using white and blue light at 470nm. There's no need for UV bulbs and no risk to the eyes or skin. 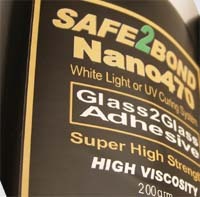 Safe2Bond Medium Viscosity - Glass to Glass, UV/Visible Light Adhesive, as above but with excess peelable. 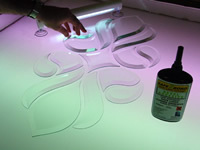 5623L - Low Viscosity UV Curing bevel adhesive used to attach decorative glass bevels to flat glass, excess wipeable. 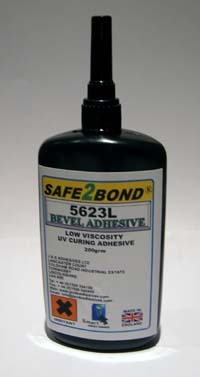 5623M - Medium Viscosity UV Curing bevel adhesive used to attach decorative glass bevels to flat glass, excess wipeable. J & S Adhesives revolutinary construction adhesives allow both large and small items to be manufacturerd without the use of U.V. Lights. View this amazing video which demonstrates the strength of bond achieved with this product. Filetype: .wmv (Windows Media Audio/Video file. 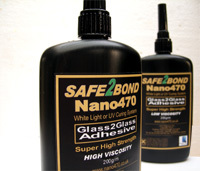 Nano470 High Viscosity Glass to Glass, Glass to Metal, Visible/UV Light Curing Construction Adhesive. Used to attach glass to glass where strength is the primary concern, manufacturing of glass furniture items and ornamental products such as trophy manufacturing. transport, trains. If its glass, it will fix it. scale deposits and polishing of glass. professionals and any other business looking to add extra profit to their business. as shop fronts being between £65 and £130 per hour. It is easy to see the potential of these kits.